Localizing (or internationalizing) your WordPress plugin means making its text capable of being translated into other languages, without having to change the plugin itself. That’s something any plugin author should want to do, considering the huge communities of non-English-speaking WordPress users and the relative ease with which internationalization can be done. Here is a list of things to keep in mind when you’re localizing your plugin, compiled from what I’ve observed plugin authors not often doing. 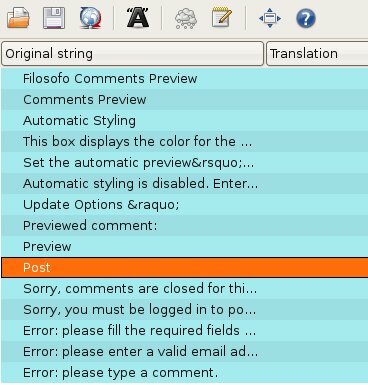 (See John Godley’s blog entry for a thorough discussion of localizing details and Ronald Huereca’s good guide to creating the .po files WordPress uses for translating). Here are my suggestions, proceeding from most commonly done to least often implemented. When you’re internationalizing your text, try to imagine how it will appear to a translator. Below is how the translation file for one of my plugins appears in Poedit, a popular .po files editor. As you can see, each localized line appears by itself, out of context. Keep that in mind as you localize. Because localized strings of text can seem disconnected when viewed by a translator, plugin authors should try to keep discrete thoughts together. Disjointed strings of text can be difficult for a translator to put back together in another language. Don’t let markup or style be overly dependent on the structure of English. For example, a number of languages read from right-to-left instead of left-to-right; an interface that assumes priority on the left, for example, could confuse international users. Throughout the core WordPress files, you’ll see that only one parameter is passed to the localization functions. In the example below, it’s the string of text “Log out of this account.” The second parameter, the text domain, is omitted, because core WordPress just uses the default domain. The first, bad, example chops the sentence into parts, which might not work independently in another language or might confuse the translator viewing a series of cryptic phrases. As much as possible, try to keep a distinct thought within one localized line. To do this, the second, good, example above uses PHP’s formatting function, sprintf. Translators would see the line “ERROR Code %1$d: %2$s is a required field” and know that wherever in the sentence the numeric error code should appear, they should insert “%1$d,” and insert “%2$s” wherever the required field string should be. Sometimes an English word has different meanings depending on its context. In WordPress, for example, the English word “editor” can mean both the user role (someone who has editing capability) and the text-area where one writes a post. In other languages, those different meanings have different words, so localization needs a way of distinguishing them for a translator. WordPress’s _c function allows you to provide that context. Use _c just as you would __, except that if you insert a pipe—i.e. “|” —everything including and following the pipe will be ignored in the output, allowing you to use the pipe to demarcate comments. The following two lines output the same in English, but the piped comments allow one to present context to the translators. Posted in Development, Plugins | Tagged Internationalization, Localization | Bookmark the permalink. Follow any comments here with the RSS feed for this post. Post a comment or leave a trackback: Trackback URL. http://blog.5ubliminal.com/129#plugin-localization … try an alternative to your method, alternative that requires no .MO file.